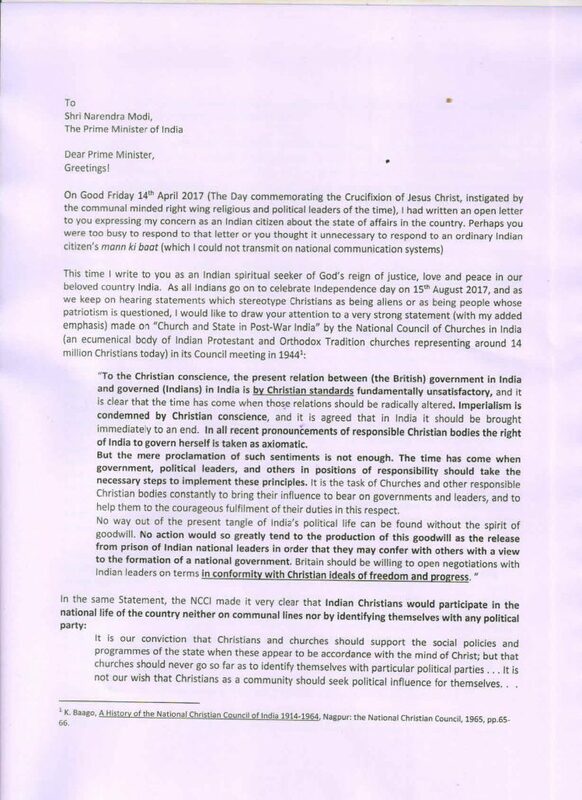 “To the Christian conscience, the present relation between (the British) government in India and governed (Indians) in India is by Christian standards fundamentally unsatisfactory, and it is clear that the time has come when those relations should be radically altered. Imperialism is condemned by Christian conscience, and it is agreed that in India it should be brought immediately to an end. In all recent pronouncements of responsible Christian bodies the right of India to govern herself is taken as axiomatic. But the mere proclamation of such sentiments is not enough. The time has come when government, political leaders, and others in positions of responsibility should take the necessary steps to implement these principles. It is the task of Churches and other responsible Christian bodies constantly to bring their influence to bear on governments and leaders, and to help them to the courageous fulfilment of their duties in this respect. No one needs to remind you that the very basis on which India was founded in 1947 was that of unity (as a country) in plurality (of religions, races, ethnicities, cultures, languages, etc.). “Gandhi never dreamt of establishing Hindu Raj in India. In 1924 he said that it was unpatriotic even to nurse the dream of Hindu Raj. Swaraj government, according to him, would be one established by the free joint will of the Hindus, Musalmans and others. Gandhi was no protagonist of religious nationalism. He never thought in terms of religious state. He believed that after Independence, India and not Hindu Raj, would come into being.” The constitution of India with its emphasis on secularism evolved out of such a spirit in 1950. There was no official declaration that India would be the country of the adherents of a particular religion. Therefore it is very hurting to hear statements being made contrary to the spirit of the founders of the country and its constitution. One is deeply pained by statements and actions which are antagonistic to the spiritual principle of vasudhaiva kutumbakam which asserts that the whole world (which includes India) is one family. Yes, in this one family, Hindu-Muslim- Sikh-Isai are all brothers and sisters. Don’t you think that it is most unbecoming of persons to enter worship places, disrupt their worship, desecrate their holy places, beat the spiritual gurus, level false charges, imprison them, and forcibly convert some of them? The heart of God cries out in anguish! You as the Prime Minister can set things in order. I discern the yearning of the God who has created you and all humanity, to bring such communal vigilantism to an end! Talking of spirituality, you are well aware that the spirit of yoga in the vedantic sense is union and integration. It has deep implications for human relationships. The ideal of any type of yoga is that all should be centred in and around the Divine and the life of the practitioners of yoga must be founded on that firm foundation; their personal relations also should have the Divine for their centre. Sri Aurobindo asserted that all relations should pass from the vital to the spiritual basis with the vital only as a form and instrument of the spiritual — this means that, from whatever relations people have with each other, all jealousy, strife, hatred, aversion and other evil vital feelings should be abandoned, for they cannot be part of the spiritual life. However, today one sees practitioners of yoga doing it for earthly jiva (self)-benefit, without attending to the spiritual responsibilities of cultivating wholesome human and ecological relationships. If I say “I am attaining the ideal physical-emotional-mental union with my inner self/the Divine”, but in day-to-day life if I discriminate against or hate my neighbor, would my yoga be perfectly balanced or truly realized? As we celebrate Independence Day on 15th August 2017, we will no doubt talk about all the development and progress the country has made. Yes, the media will proudly highlight all the economic and technological attainments. Yet the question remains: Have the poor of India really been benefitted or is it only the middle class, the rich and the super-rich, all of whom would constitute hardly 30% of the population? It is said that once Swami Vivekananda looked to the sky and wept asking, “Why is my country suffering with poverty in spite of so much spiritual knowledge?” On another occasion Swami Vivekananda lamented, “And, oh, how my heart ached to think of what we think of the poor, the low, in India. They have no chance, no escape, no way to climb up. 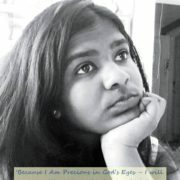 The poor, the low, the sinner in India have no friends, no help — they cannot rise, try however they may. They sink lower and lower every day, they feel the blows showered upon them by a cruel society, and they do not know whence the blow comes. They have forgotten that they too are men.”  So Swami Vivekananda exhorts: Each one of us pray, day and night, for the downtrodden millions in India, who are held fast by poverty, priest craft, and tyranny – pray day and night for them. I am no meta physician, no philosopher, nay, no saint. But I am poor, I love the poor…. Let these people be your God – think of them, work for them, pray for them incessantly – the Lord will show you the way. 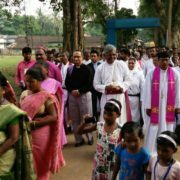 Included among the poor are the oppressed dalits and the exploited and displaced tribals ad adivasis, and in particular their women. 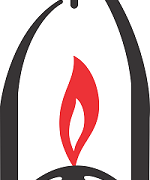 I am sure, in your quiet reflective spiritual moments, your heart goes out to all vulnerable people of our land. May the Spirit of Creator God make you a loving Father of every member of the Indian family! May the Spirit of the God of Truth grant you wisdom to lead this great country in the way of holistic growth! May the Spirit of the God of Justice empower you to stop all injustice in the land! May the Spirit of the God of Peace fill you with the joy of having contributed to the reign of God on earth! K. Baago, A History of the National Christian Council of India 1914-1964, Nagpur: the National Christian Council, 1965, pp.65-66. 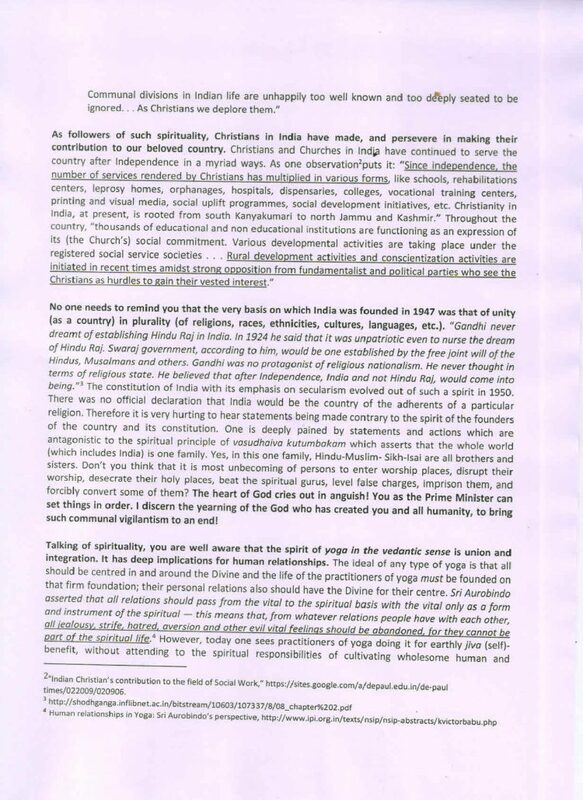 “Indian Christian’s contribution to the field of Social Work,” https://sites.google.com/a/depaul.edu.in/de-paul times/022009/020906. 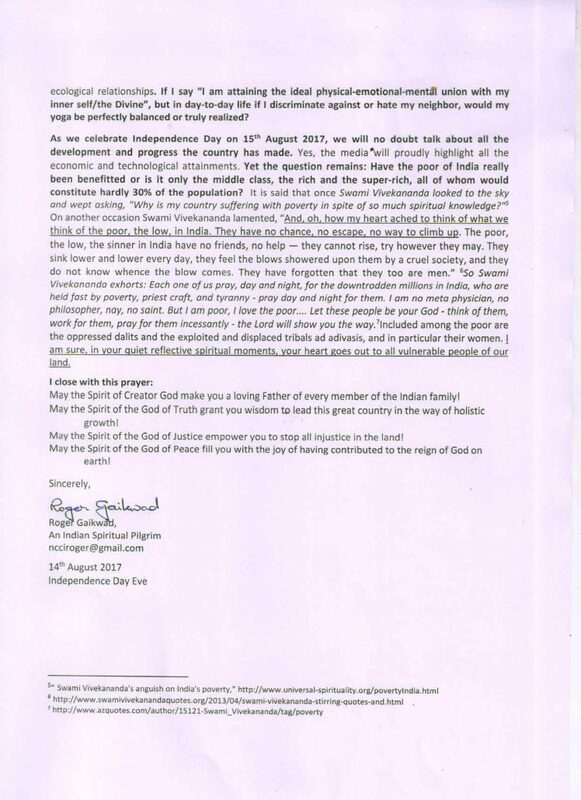 Open Letter Prime Minister of India from Rev. Dr. Roger Gaikwad.